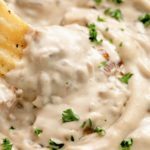 This French Onion Dip is loaded with flavorful pieces of caramelized onion in a non-dairy sour cream. Great served with chips, crackers or fresh veggies! Onions: Heat the oil/water in a nonstick skillet over medium heat. Add the onions and saute for 10-15 minutes, stirring every few minutes. Add a little bit of water/veggie broth and let it sizzle and evaporate. Keep stirring every so often, add more liquids. After about 25 – 30 minutes, onions should be caramelized and fragrant. Mix: Add the onions, garlic & onion powder, and worcestershire, mix well to combine. Taste for seasoning. Serve: Serve topped with chopped parsley. Pair your french onion dip with chips, crackers, and/or sliced vegetables. Store leftovers, covered, in the refrigerator for up to 6 days.